Chelsea Green Publishing Company, 9781603580625, 246pp. 2017 is the 50th anniversary of The Dian Fossey Gorilla Fund and Karisoke Research Center in Rwanda. Three astounding women scientists have in recent years penetrated the jungles of Africa and Borneo to observe, nurture, and defend humanity's closest cousins. Jane Goodall has worked with the chimpanzees of Gombe for nearly 50 years; Diane Fossey died in 1985 defending the mountain gorillas of Rwanda; and Birut Galdikas lives in intimate proximity to the orangutans of Borneo. 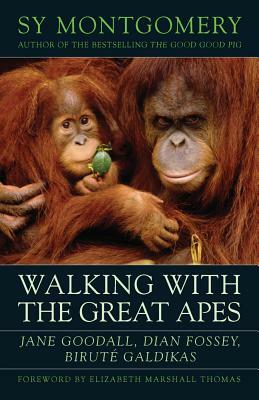 All three began their work as prot g es of the great Anglo-African archeologist Louis Leakey, and each spent years in the field, allowing the apes to become their familiars--and ultimately waging battles to save them from extinction in the wild. Their combined accomplishments have been mind-blowing, as Goodall, Fossey, and Galdikas forever changed how we think of our closest evolutionary relatives, of ourselves, and of how to conduct good science. From the personal to the primate, Sy Montgomery--acclaimed author of The Soul of an Octopus and The Good Good Pig--explores the science, wisdom, and living experience of three of the greatest scientists of the twentieth century.